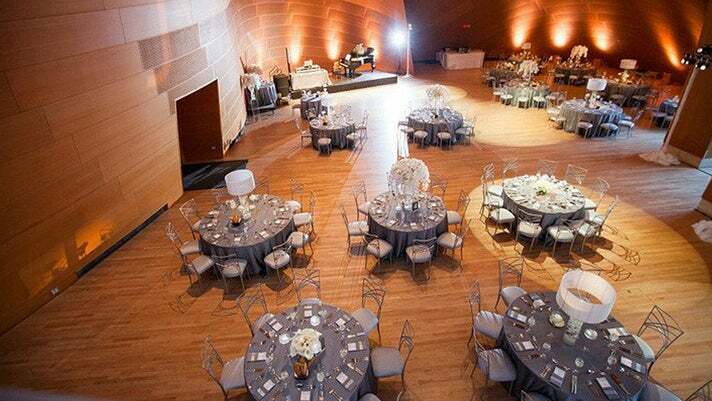 L.A. Concert Venues That Double as Event Space | meetL.A. Photo Courtesy of Belasco Theater. Opened in 1926 and located in Downtown Los Angeles, the Belasco Theater is a world-class multi-purpose event and entertainment complex whose stage has hosted popular acts such as Coldplay and Sam Smith. 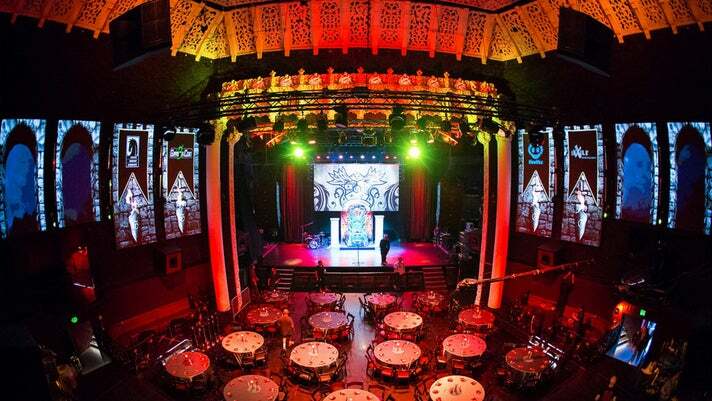 With more than 40,000 square feet of space, the Belasco Theater offers a diverse set of dazzling options for your next event from a main theatre, ballroom, basement lounge, wine/tapas bar, and two restaurants. 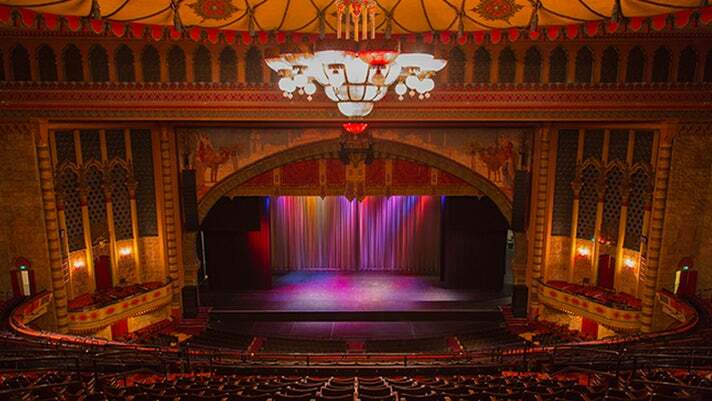 The Belasco’s historic Main Theater boasts vibrant colors, ornate detailing, multiple floorplans and can accommodate up to 1,500 guests. Photo Courtesy of The Novo by Microsoft. 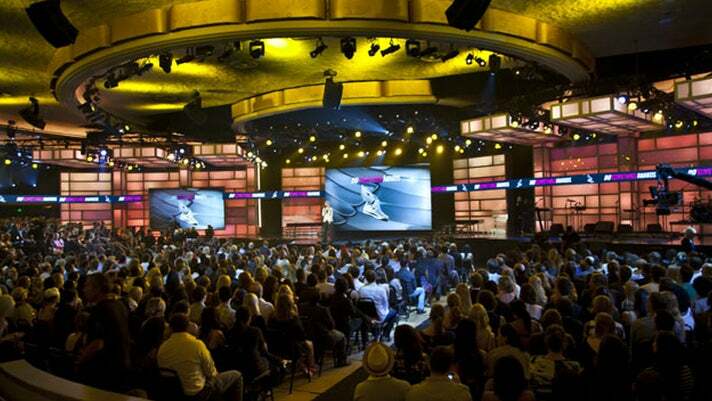 The Novo by Microsoft is located in the center of the entertainment capital of the world - L.A. LIVE. This popular venue has hosted acts such as 50 Cent, Jimmy Eat World and Matisyahu. With approximately 59,000 square feet of space and room for up to 2,300 guests, The Novo is an ideal venue for corporate events, galas, and after parties. 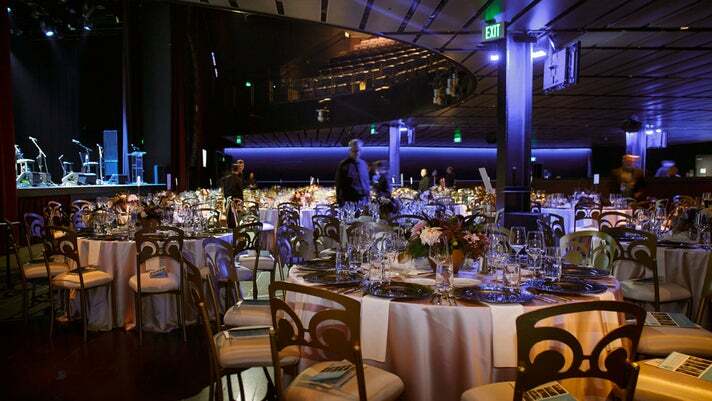 In addition to the main theater, the venue includes The Lounge, a distinctive and desirable event space within The Novo, offering an upscale L.A. ambiance, eye-catching décor, custom design, and exciting energy for corporate or private events. The Lounge can be utilized privately or in conjunction with a live show or event in the main room. The Novo and The Lounge are exclusively catered by Wolfgang Puck Catering, which can customize a menu for any type of event! Photo Courtesy of Shrine Auditorium and Expo Hall. Built in 1926, the Shrine Auditorium and Expo Hall is the perfect balance of old school architecture and design with modern technology and functionality. Designed in the Moorish Revival Style of the 1920s, the building itself is a work of art, complementing the performances and events that take place within its walls. 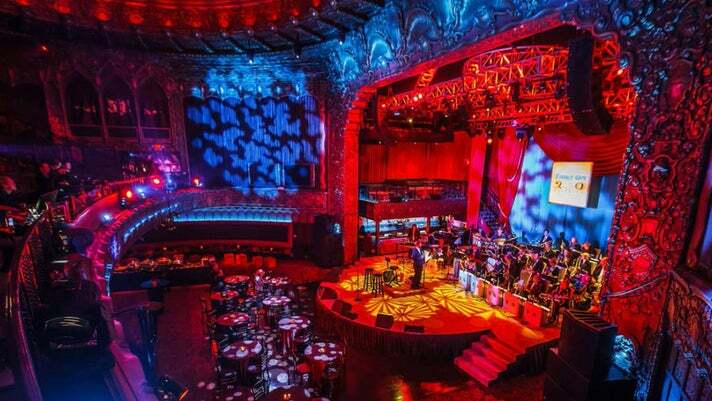 Located in Downtown Los Angeles, the Shrine has hosted an incredible assortment of musical acts, including Frank Sinatra, Bruce Springsteen, Jimi Hendrix and Jack White. The Shrine also hosts orchestral concerts, ballets, film festivals and theatrical performances. 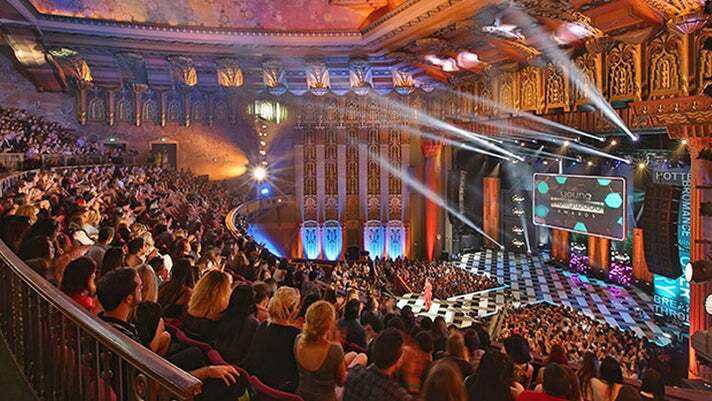 With a capacity of 6,300, The Shrine Auditorium is one of the largest theatres in Southern California. It also boasts the largest proscenium stage in North America. The attached Expo Hall is 54,000 square feet of versatile event space that can fit up to 5,000 people. Photo Courtesy of Walt Disney Concert Hall. 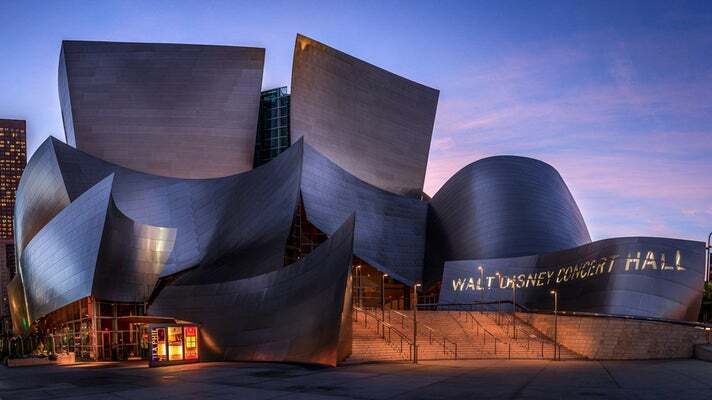 Designed by legendary architect Frank Gehry and home to the Los Angeles Philharmonic, Walt Disney Concert Hall (WDCH) is an internationally recognized architectural landmark and one of the most acoustically sophisticated concert halls in the world. From the stainless steel curves of its striking exterior to the state-of-the-art acoustics of the hardwood-paneled main auditorium, the 3.6-acre complex embodies the unique energy and creative spirit of the city of Los Angeles and its orchestra. The auditorium is configured in a “vineyard” style, which allows for seating on all four sides of the stage and can accommodate up to 2,252 guests. Photo Courtesy of The Wiltern. Located just 3.5 miles from Downtown L.A., The Wiltern evokes a period of elegance and style with its colorful terrazzo paving and art deco design. Originally built in 1931, the Wiltern was designed by architect Stiles O. Clements and can accommodate up to 1,875 seated guests or 2,300 standing guests. The Wiltern Theatre was originally designed as a vaudeville theater and has hosted acts such as Elton John, Nine Inch Nails and The Strokes. Photo Courtesy of El Rey Theatre. The El Rey Theatre is an original art deco theater in the heart of the Miracle Mile, one of L.A.'s best preserved art deco districts. The El Rey was built in 1936 and designed by Clifford Balch. After over 50 years as a first run movie house, the El Rey was converted into a live music venue in 1994 and has since hosted acts such as Justin Timberlake, Regina Spektor and Father John Misty. 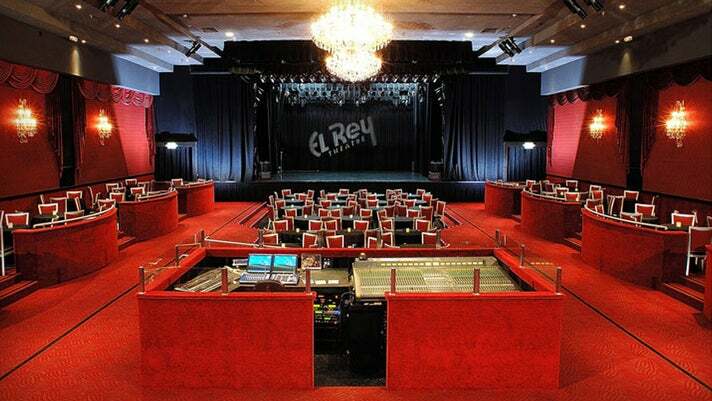 A registered Historic-Cultural Monument, the El Rey has sweeping staircases, an art deco lobby, VIP balcony lounge, a grand ballroom equipped with a full stage and capacity for up to 771 guests. Photo Courtesy of Hollywood Palladium. The first performer to grace the Hollywood Palladium stage was a young, 24 year old Frank Sinatra. He sang with the Tommy Dorsey Orchestra during Opening Night in October 1940. Since then this classic theater, located in the heart of Hollywood, has become a part of L.A.’s musical history. The main floor can be set for premiere parties, award shows, new product presentations, general meetings and even dining and dancing. The Hollywood Palladium is one of the largest special event venues in Southern California and can accommodate up t0 3,800 standing guests and 2,000 seated guests.